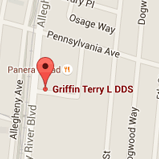 Dr. Griffin has been serving Oakmont and surrounding communities since 1986. He received his D.M.D. degree from the University of Pittsburgh in 1985. Dr. Griffin is currently a member of the American Dental Association, the Pennsylvania Dental Association, and the Western Pennsylvania Dental Society. In the past, Dr. Griffin has served as the President for the Allegheny-Kiski Dental Society, the dental alumni board for the University of Pittsburgh, and has been a member of the Seattle Study Club for the past 10 years. Dr. Griffin, and his wife, Carolyn, raised their four children, Mindy, Abbey, Sam, and Tim in Oakmont, PA. Dr. Griffin’s favorite activities are family, golf, bowling, travel, and woodwork. His woodworking skills can be attributed to his degree in industrial arts, and his years spent prior to becoming a dentist as a Riverview Jr./Sr. High School industrial arts teacher. 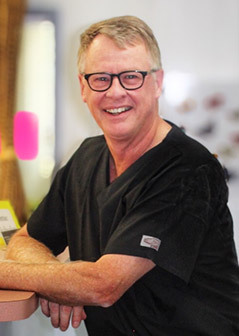 Dr. Griffin is committed to providing the highest standard of care with modern techniques. He enjoys all aspects of dentistry, and is committed to the Oakmont Community.